Bushwalking Skills: Bushwalking Equipment | Which Type of Walking Pole is Best? 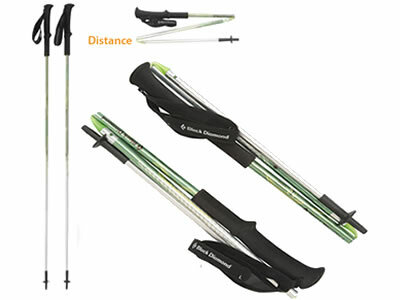 Bushwalking Equipment | Which Type of Walking Pole is Best? Should my poles be adjustable in length? Which material should they be made from? Do my poles need shock absorbers? Are the new ultra-light, foldable poles worth the extra expense? While I don't have much experience with poles other than my collapsible poles which have shock absorbers, I hope to summarise some of the discussion I have read. Adjustable poles are a definite bonus as they need to be lengthened for downhill and shortened for uphill. There is however a downside and that is the additional weight and the remote possibility that they could collapse. Fixed length poles overcome this problem by having a longer hand grip so you can move your hand up and down to suit the slope, but I suspect this is a less than satisfactory solution due to the difficulty of adjusting the wrist strap and the inability to place your palm over the end of the pole when descending to give additional support. They usually come in several sizes. Most poles are made of high tensile aluminium, not unlike tent poles. Graphite versions are available, and for those that wish to go ultra-light, they are an obvious but more expensive choice, weighing less than 300 g.
I am not sure about their value over difficult terrain, but they could be effective on hard surfaces at high speed. For some applications such as crevasse crossing they are a disadvantage as they don't allow the same ability to measure resistance on snow bridges. There seems to be a fair bit of consensus that shock absorbers are just another thing to go wrong, and if they do, difficult to repair in the field. I like the idea of being able to stow my poles inside my pack, next to my tent poles. Having them on the outside is an invitation for them to get caught during shipping and for the attachment points to get ripped from your pack. Field tests show foldable poles to be very reliable, fast to assemble and lock together firmly. Usually they have three sections and join together like tent poles or an avalanche probe. When folded they are not quite as compact as the collapsible, telescopic type, but are shorter and lighter. Well know brands include Black Diamond and Leki and they usually come in three or four sizes. If you need a pole as an integral part of your ultra-light tent you will need to select length carefully. They are however "chokable" ie the handle section collapses/expands a little to allow for the different lengths needed for ascent or descent. Other features to check before purchase. Are the rubber and metal tips easily interchangeable? Are the wrist straps comfortable? Are the baskets a suitable size for use in mud or snow? Bushwalking Equipment | Are Walking Poles Useful for Bushwalkers?